A couple of days ago, the Twitter blog unveiled the top trending topics on twitter in 2009. Here comes Facebook with their very own "top topics" of 2009. The topic mentioned in list include Twitter, FML and Family. These most mentioned topics are mainly determined by the number of times each word appear in status updates. Here's how Facebook generated the list of top topics. 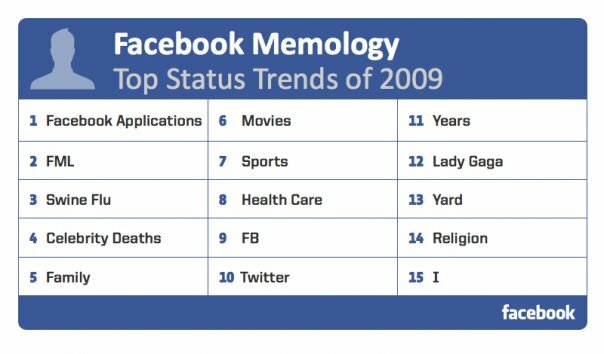 "To generate the list, we started by looking at how many times each phrase with length from one-to-four words occurred in U.S. Facebook status updates, then we computed the rate at which each phrase occurred in 2009 compared to 2008. Using some data-mining methods detailed here, we analyzed important bursts in activity around words and series of words to find the key trends for the year. All personally identifiable information was removed from the status updates to conduct this analysis, and no one at Facebook read the individual status updates. Because quite a few words and phrases were related to each other and correlated contextually, we grouped some of them together to form the final list that follows."